Today, I was invited to give a talk in Paris about Mozilla and innovation, and Mozilla has received an award for being innovative (but also being a platform for innovation). It was a great honor to receive such an award, with other organization on stage with me such as Touch Bionics, Archos, Pan-African e-Network, Aldebaran Robotics, Groupe SEB, The City of Helsinki and Dassault Systemes. 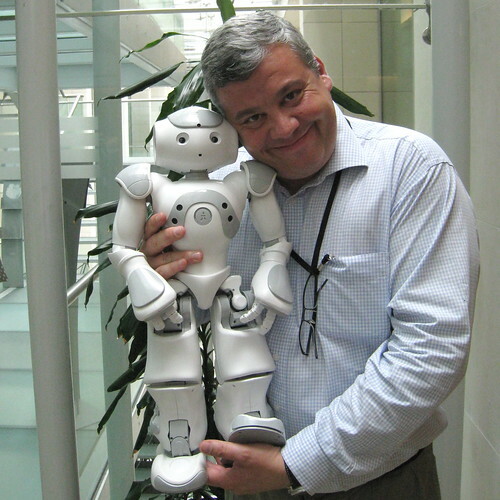 I was particularly amazed by the Pan-African e-Network (India helping Africa for Education using technology) and Aldebaran (amazing little robot which is ridiculously cute). As the person receiving the award in the name of Mozilla, I had to say a little speech about what we do at Mozilla, and how we do it. 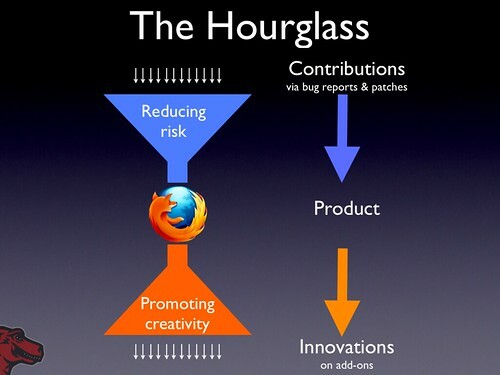 The Mozilla development process has been explained many times in many places and languages by many people. This time, as the whole event is about innovation, I decided to focus on the way Mozilla does Open innovation (or Participative innovation). Here is a quick recap of what I said to the audience (shamelessly stolen from the Labs team and Chris Beard). Slides are available in PDF format (2.6MB). Mozilla, non-profit organization, builds products (including Firefox, 400 million users) and communities (that build/test/localize/promote the product and its add-ons, and also help users). Our vision of the Internet is explained in our Manifesto. We "believe that openness, innovation, and opportunity are key to the continued health of the Internet". Our development process is focused on building great products, with participation from thousands of people around the world. With 75 languages and 3 platforms (leaving mobile on the side for now), each release is actually 225 versions of Firefox. Shipped simultaneously, aiming at 400 million users. This leaves very little room for crazy ideas that may damage the stability, security and ease of use of Firefox. Our development process is basically a funnel that makes sure that contributions are valuable for our users. But this limits innovation (don't worry, I'll explain next how we actually innovate, on a very large scale). Very little interference with release cycle. You don't have to wait for the next release of Firefox to collect feedback on your work. It's very easy to share an add-on. Post it on your Web site, or even send it as an email. Ability to serve the long tail of innovation. Your idea can be useful to 2 people on this planet. That's OK.
Best ideas that are useful to a majority of users while not degrading the user experience can be integrated into a future version of Firefox, sometimes after a rewrite. Add-ons span a very broad space, from Firefox Sync to BetterPrivacy, including FlashBlock, OptimizeGoogle, and one of the least popular-yet-super-useful (for me at least) Thitan. Building an Internet that benefits everyone. 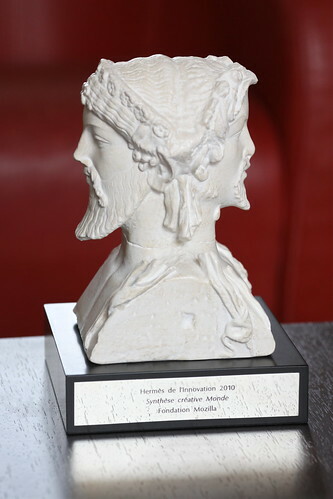 In my speech, I dedicated the award (representing Hermes and Dyonisos, respectively Greek gods of invention and creativity, among many things) to contributors, supporters and users of Firefox and Mozilla technologies. Oh, and by the way, a quick poll from the audience — people working in the field of innovation — showed that roughly 80% of them were using Firefox. The notion of Generativity is taken from the highly-recommended The Future of the Internet book by Pr Jonathan Zittrain. It explains how PCs, combined with the Internet, are "generative" and enable people to invent the future. Hackable in the most noble sense, referring to ingenuity, not in the sense too often used by the press to refer to pirates and crackers. 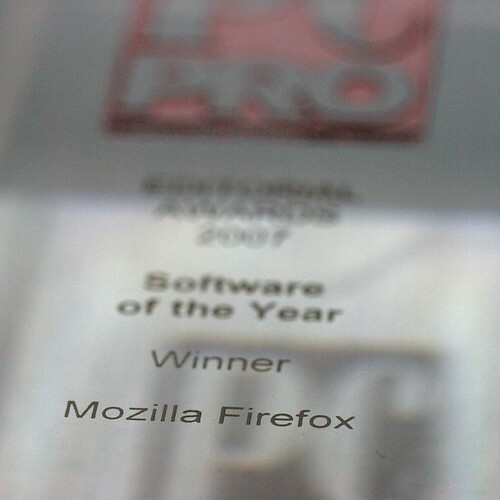 I am sure this means a lot to the Mozilla community at large. It does to me, at least! I'm hoping this will help us increase our market share in the UK, which is half of what is is on average in the rest of Europe. Talking about the UK, I was in London yesterday, for the Online Information Conference, where I had to deliver a track keynote. I did the trick like I did in Berlin last time at Web 2.0 Conference. In London, "only" 60 to 70% of people in the room where using Firefox, which is still much better than the country average. One of the reasons is of course that if you attend such a conference, you're more likely to use a modern browser. But it's not the sole reason. Later during the day, one of the speakers asked the crowd is there were librarians in the room, and an unusual number of hands raised. I like to think that librarians understand better than most the need for common standards for information conservation, and the choice of tools to access this information, hence choosing massively Firefox.